Brunel's biggest engineering failure was supposed to have been the Hyperloop of its time. 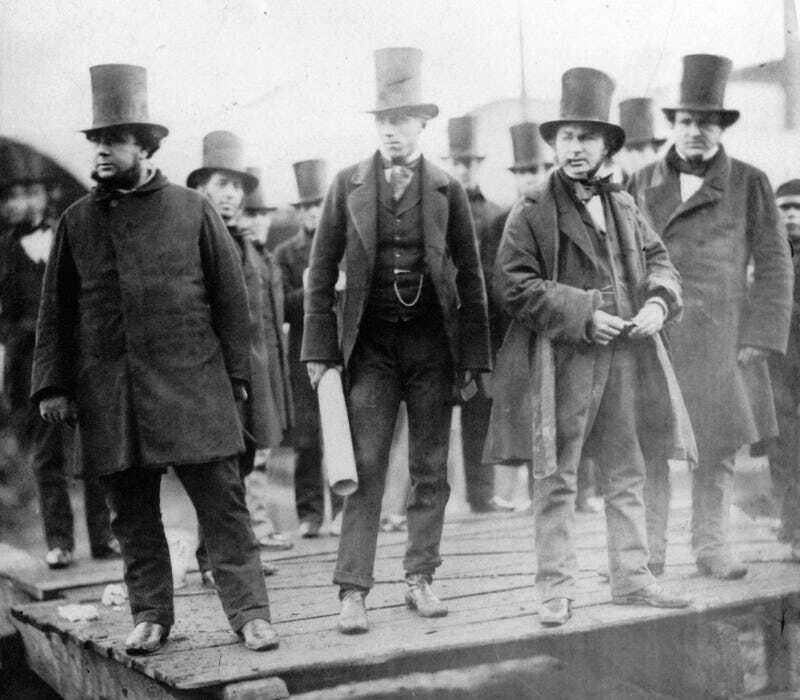 Isambard Kingdom Brunel stands second from right. Isambard Kingdom Brunel may have been the most talented and visionary civil engineer of his time, but did make a few blunders during his brilliant career. His original propeller design for the SS Great Britain, for example, was wholly unsatisfactory, shedding blades in rough seas. But that was a minor failure compared to his biggest mistake, the atmospherically propelled South Devon Railway. For all his talents in building tunnels, bridges, and railways - Brunel usually left the designing of the machines that worked them to others. The Great Western Railway suffered from an unreliable collection of mechanically freakish locomotives Brunel had bought before hiring on Daniel Gooch as the locomotive superintendent. Gooch threw away the old locomotives and brought in new designs that allowed Brunel’s exceptionally well engineered railway to live up to its potential. But Brunel’s haphazard locomotive purchases were not the only time he bungled up supplying a railway with motive power. The South Devon Railway was going to be a big challenge for Brunel. The route required going up relatively steep grades, and lots of curves. Although he knew the route could be worked by steam locomotives, he had some doubts about whether or not this would be the best choice. Brunel was aware of a railway which used a novel form of propulsion - air pressure - operating in Dalkey, Ireland, and thought maybe this would be the answer to his problems. The Dalkey Atmospheric Railway ran up a relatively steep, two mile line, and used no locomotives. Instead a stationary steam engine pumped the air out of a pipe laid in between the rails. Inside the pipe was a piston which was sucked along by the vacuum. The piston was connected to the train, pulling it up the railway. It was, theoretically advantageous over steam locomotives and cable railways, being relatively simple and seemingly sturdy. And it seemed to be just the thing Brunel needed to work his new South Devon Railway. Unfortunately, while this system worked well on the short, single line of the Dalkey Railway, it posed a number of engineering challenges when adapted for use on a longer railway. The pipe which sat between the rails was especially troublesome at road crossings. A convoluted system had to be devised for allowing the train to cross over roads without blocking them. A longer rail system also needed pumping stations located every few miles to keep the vacuum up, rather than one station at the end of the line as at Dalkey. Even so the system was supposed to cost less than using steam locomotives. Brunel expected annual savings of £8,000 using atmospheric propulsion. And so the South Devon Railway was constructed. It was built as a single line, and with lighter weight rail than would have been necessary to carry locomotives. Pumping stations were built, and the atmospheric pipe was laid down. Brunel ran tests, and everything seemed to be working beautifully. Atmospherically hauled trains began running in late 1847. They were quiet, they were clean, and they were fast. But major problems were just around the corner. In order to connect the piston in the pipe to the train above it, the pipe had to have a slot in its top. The slot was kept air-tight by a greased leather flap. When the piston travelled through the pipe, a pair of rollers lifted the leather flap behind it allowing air into the pipe at atmospheric pressure, but also allowing an arm from the train to connect to the back of the piston. Once the arm passed, the leather flap dropped and sealed the slot again. On the 18th of January, 1848, a severe frost kept the leather flap from forming an air tight seal. No trains could run until the frost thawed. Worse was still to come. Rats seem to have found the tallow lubricated leather flap rather delicious, and caused considerable damage. The rats would sometimes be sucked into the tube after breaching the seal. Another considerable problem was the use of different diameter pipes for different sections of railways. Steep inclines required a larger diameter pipe, which meant exchanging pistons wherever pipe diameter changed. Further, trains had to be shunted by horses, as there was no convenient way to reverse direction of travel. Ultimately the system turned out to be too cumbersome for day to day use on a real railway system. The savings on operating costs failed to materialize, fuel costs being much higher than anticipated because the pumping engines had to work harder than planned to maintain vacuum in pipes with rat-eaten seals. By September 1848 it was all over. Atmospheric operation was suspended, and hundreds of thousands of pounds worth of nearly new equipment used for atmospheric operation was now worthless. It was the biggest disaster in Brunel’s engineering career. The railway was relaid for steam locomotive operation. An original section of South Devon Railway track and pipe.